Spirits-- can't live with them, can't live without appeasing them. In Asia, nature or 'supernatural' forces are very much a part of one's being and not disconnected as it is in the modern west. When people move into a new home they create a disturbance in the natural world. 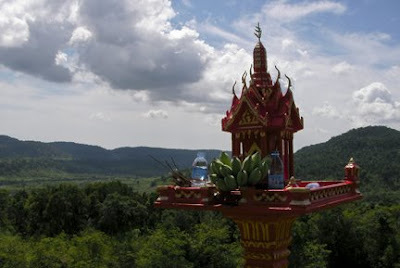 In a gesture of deference and to re-balance the natural surroundings, it is tradition to appease the displaced spirits. Bribes of various sorts ranging from incense, fruits, vegetables, water and rice etc are regularly placed in these houses, sort of like an eviction compensation. It isn't that the spirits will actually eat them, and in fact some of these houses can be left in such a state as to seem that the spirits are expected to clean their little abodes. They will not. These are symbolic acts of respect towards the earth and to divine beings who live alongside us. See the bananas and bottles of water in the first photo? 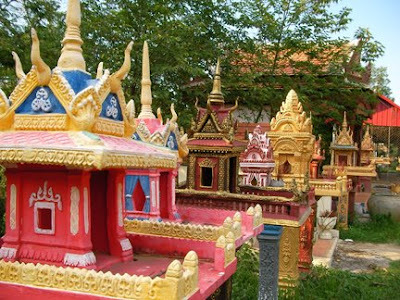 On the road down to Koh Kong there are a few spirit houses placed along the sides of the road. Sometimes people will stop, leave a lagniappe and ask the spirits in that area to look over them in their travels and keep mischief and danger away. If many accidents have occurred on a specific road a spirit house will be placed there, to allow travelers to pacify the tormented spirits. It's interesting to note that I have never seen birds nesting in these houses, nor eating the plentiful fruits left at them. I hadn't had a drop of clue or curiosity yet to ask my Khmer colleagues and friends why this is so. I guess it satisfies my sensibilities that it really does have to do with an otherwordly presence.